The most innovative fintech companies have two things in common. They’re getting a lot of attention from investors, and they’re using technology to dramatically simplify financial transactions. That’s our conclusion from reading a new ranking from Forbes on the most innovative fintech companies in 2019. And when you pause to consider what each company is trying to do, it’s easy to see why investors believe there is significant value to be had in competing against traditional players. Fintech companies focused on processing payments are receiving the lionshare of outside investments, according to a new set of figures from Forbes. Companies built on the blockchain and cryptocurrencies are also a distinct and growing category in the fintech world, earning more than $1B in investments. Regardless of industry, the most innovative fintech companies are using technology to make previously complex or difficult tasks incredibly easy for consumers. Forbes only looked at private companies in the U.S., broadly defined as either a physical headquarters, an operational presence or a target market of American consumers. We created a bubble according to the size of each company’s funding, then we color-coded and grouped each one based on the main type of business it conducts. We added the logos for easy reference, letting you quickly see where the biggest action is for fintech companies this year. 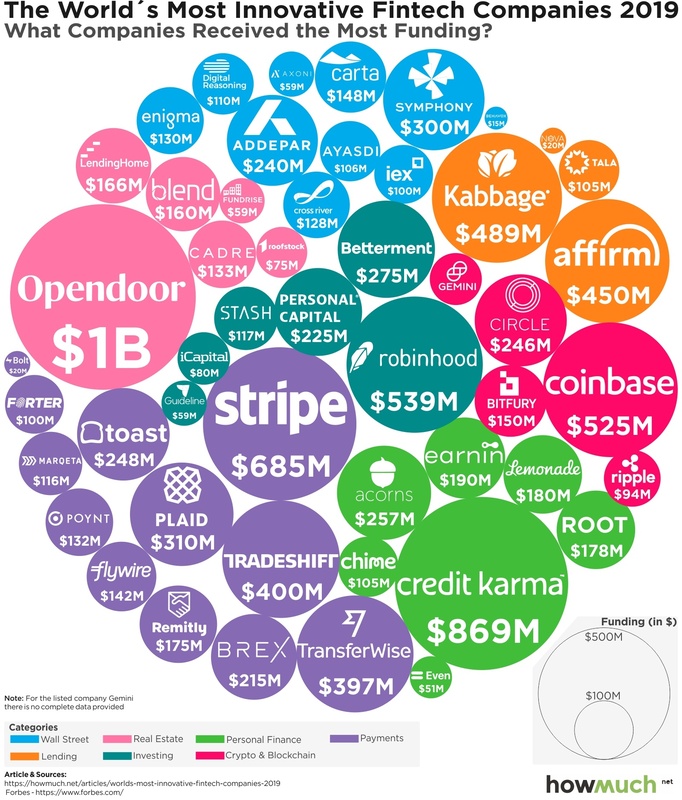 39 companies received more than $100M in outside funding, led by Opendoor at $1B. Remember, these are not total valuations, which would all be significantly higher. In fact, according to Forbes, 19 out of the 50 are valued at $1B or more. Instead, these figures indicate investments that people and companies are making into fintech. All told, there’s over $11B represented in our visualization. In terms of market dominance, payment companies are taking the lionshare of funding, totalling some $2.94B. Stripe ($685M) is the obvious standout with a global business centered around making it easy for businesses to accept payments from customers. The company is valued at an incredible $23B. That’s more than twice its value the last time we wrote about Stripe just 16 months ago. We’ll have to see how its involvement in the investigation into President Trump’s inauguration influences future investments. The personal finance industry is the second leading category in private fintech investments, most notably Credit Karma ($869M). Any company that successfully makes it easy to manage personal finances will no doubt attract a lot of attention from investors. We should also mention Lemonade ($180M), a company that’s disrupting the renters and homeowners insurance industry by using analytics to approve applications and process claims. There are lots of other cutting edge tech companies in our visualization too. Robinhood ($539M) offers $0 commissions to trade individual stocks, making it fast and easy to trade on a smartphone. Betterment ($275M) provides consumers with a tailored financial advice to fit their individual needs. And then there are a number of cryptocurrency and blockchain companies, like Coinbase ($525M), one of the leading platforms for buying and selling bitcoin. Categorizing companies like this will always be somewhat arbitrary. For example, you can buy bitcoin on Robinhood, but we’re still calling it an investment company because you can also buy traditional stocks and mutual funds. It’s still a useful exercise because a small but growing group of companies using blockchain technologies is threatening to disrupt a variety of different industries. The five companies shaded red on our visual have already received over a combined billion dollars in funding. We’re betting they will continue to grow and challenge the underlying business models of more established companies.